There is no doubting the work capacity of Mikko Salo. Ever since his debut at the 2009 European Regional he has set the bar high. At the 2009 Games he commanded attention with amazing performances in back to back events that exposed an enormous bandwith of physical capacities. Again at the 2010 CrossFit Games, where he finished in 5th place, his performance was elite. However, there are still a handful of skill-based movements that put a cramp in the '09 champ's style when they are pulled from the hopper. The double-under is one such movement. 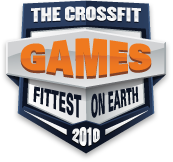 During his decompression from the 2010 CrossFit Games, Mikko stayed in California and trained at CrossFit Santa Cruz. In this video, Hollis Molloy coaches Mikko towards success in the highly frustrating movement. It's frightening to think of a Mikko with the skills to match his capacities.